This study examined the associations between perceived parental care and control in childhood and maternal anxiety, depression and parenting stress during the transition to parenthood. Eighty-eight women completed the Parental Bonding Instrument, self-report measures of anxiety and depression and a structured diagnostic interview (Mini-plus International Neuropsychiatric Interview) during the third trimester of pregnancy. The MINI-Plus and anxiety and depression measures were re-administered at 7 months postpartum. The Parenting Stress Index was also administered at this time. Significant associations were found between maternal ‘affectionless control’ and prenatal and postnatal symptom measures of anxiety and depression, p values <0.005. 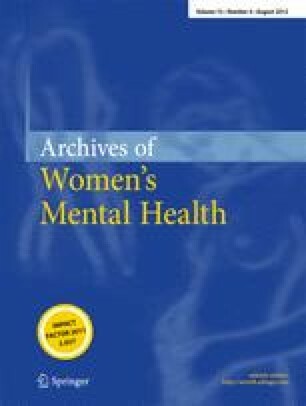 Compared to women who reported optimal parenting, women who recalled maternal ‘affectionless control’ were also six times more likely to be diagnosed with an anxiety disorder during pregnancy (OR = 6.1, 95 % CI = 2.17–30.11) and seven times more likely to be diagnosed with postnatal major depression (OR = 6.8, 95 % CI = 1.80–25.37). Paternal ‘affectionless control’ was associated with significantly higher scores on symptom measures of prenatal and postnatal anxiety, p values <0.005. This study suggests that assessing a woman’s own parenting history is important in identifying and managing the risk of prenatal and postnatal affective disorders and parenting stress. We wish to acknowledge the financial support from the NHMRC (Program Grant 222708), the Black Dog Institute and St John of God Health Care (infrastructure funding). Thanks also to Ms. Elizabeth Carr for proofreading and checking this manuscript. Ethical approval was granted by the Human Ethics Review Committees of the South East Sydney Illawarra Area Health Service, the University of New South Wales and Macquarie University. All participants provided informed and written consent.